Buy 'Uncanny Networks: Dialogues With the Virtual Intelligentsia' by Geert Lovink. HOW OFTEN does a legendary technological outlaw from Holland speak to a Silicon Valley audience? Not often enough, to say the least. Geert Lovink was a founding member of Adilkno, the Foundation for the Advancement of Illegal Knowledge, a free association of media-related intellectuals that rose from the ashes of the squatters' movement and the pirate-radio scene in Amsterdam 20 years ago. In 1995, Lovink gave birth to an entirely new discourse by co-founding the innovative Nettime mailing lists, an online discussion forum for artists, scientists, theorists, intellectuals, hackers or anyone who had anything to say about Internet culture. 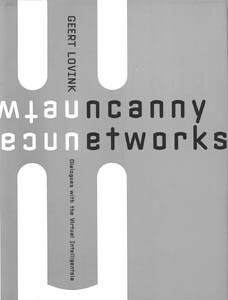 Lovink subsequently rose to fame as an independent media theorist, net critic and radical techno-pragmatist, often foreseeing the ever-changing directions of net culture and how it interpenetrates our lives. Lovink, who now lives in Australia, will invade the Bay Area as a speaker for the first time next week. His latest book, Uncanny Networks: Dialogues With the Virtual Intelligentsia (MIT Press/Leonardo Book Series; $27.95), explores the idea of an email interview as a constantly evolving discourse. Shunning the impromptu microphone interview, Lovink prefers to spend a few months engaging people in electronic dialogue, resulting in the concept of an "interview as imaginative text." Giving people more time to think deeply--and allowing them to cut and paste from other interviews--elicits a more profound and thoughtful response, he believes. In the book, he interviews 35 artists, critics, scientists, philosophers and theorists, offering perspectives on everything from the political economy of media to Japanese techno tribes. Lovink is in town to hype Uncanny Networks as well as his previous tome, Dark Fiber: Tracking Critical Internet Culture, which just came out last October. A collection of dispatches on a number of topics, Dark Fiber discusses the rise and fall of dotcom hysteria, the inner workings of cyberactivist groups and the ever-growing tendencies of corporations and governments to mold the Internet into a business and information environment free of dissent. Here in Silicon Valley, where technoculture is omnipresent and the corporate-biased "digital revolution" reigns supreme, folks might be surprised to know that a worldwide cybercommunity of techno-philosophers don't see things the same way we do. Lovink offers a significant perspective, as he's been involved with new media artists, researchers, radicals and technophiles around the globe for a long time. Joel Slayton, director of the CADRE Laboratory for New Media at San Jose State University, wrote the forward for Uncanny Networks. "Silicon Valley doesn't sit in the world autonomously by itself," he warns. "The Internet has created a distributed consciousness throughout the world, resulting in people working and thinking about technology in many different ways. And we often aren't conscious of the fact that there are other ways of looking at the issues surrounding networked culture and the emergence of new media. Geert Lovink has been traveling the world, interviewing new media artists and artists working with networked technology and getting their viewpoints. It's important to hear what he has to say." Geert Lovink lectures on Monday (April 21) at the IDEO Auditorium,831 High St, Palo Alto; 6pm mingle, 7pm presentation. Co-presented with the CADRE Laboratory, San Jose State University, and Leonardo/ISAST. Space is limited; RSVP to [email protected], 650.858.3843.